Dalston Square flats: Get one half price! Last year we reported how Barratt, which is developing Dalston Square in a private/public partnership with the authorities, had been credit crunched and was tettering on the brink of insolvency. Its share price had crashed by 90% and its £1.5 billion debt was in the news. Former blue-chip builders like Barratt became relegated to the middle tier as funds flooded out of the sector. But it managed to renegotiate its bank covenants and could "limp along"
Although things picked up slightly in the first quarter of this year, and Barratt's shares rallied, those green shoots have been caught out in the recurrent economic frosts of the credit freeze. Mortgage offers are around only 40% of the boomtime peak and are now falling again. Finance experts are reportedly advising investors to sell this risky housebuilder's shares. These are desperate times with market analyists reporting property prices have not yet reached the bottom. Barratt are now slashing sale prices like there could be no tomorrow. Can Barratt afford to start building the towerblocks on The Slab, on TfL's railway site next door, which should be ready for development in October? Will some of the funds allocated in Alistair Darling's budget, to bail out stalled housebuilding schemes, be used to save TfL's Olympic towerblocks which are all intended for private sale? Hackney Council invested in the £19million shortfall on the loss making Dalston Square scheme. The deal was it would start to recoup when sales went over a certain figure. Will it ever get our money back? OPEN Dalston, working with local businesses and community organisations, is organising a series of events in April to highlight Hackney Council’s Masterplan for Dalston. The Council have started a public consultation on their draft proposals for the area. 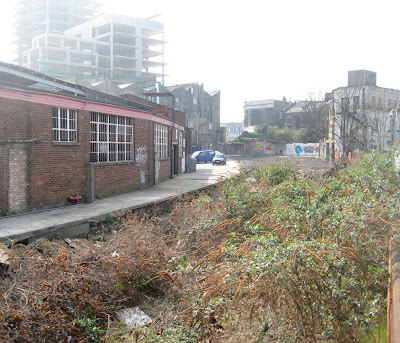 This document will influence the building development that will take place in Dalston in the coming years. 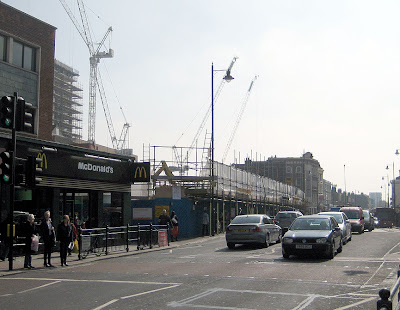 Ridley Road Market, the Georgian terraces on Dalston Lane, Kingsland High Street and Ashwin Street are just some of the areas identified for redevelopment. Tall buildings, affordable housing, open spaces and the use of heritage buildings are among the issues covered. OPEN Dalston’s events will give you the opportunity to ask questions, explore issues and discuss concerns about all aspects of the plans। Information gathered during these events will be included in OPEN’s response to Hackney Council on the Masterplan consultation and the events are also designed to assist people who want to make their own responses. 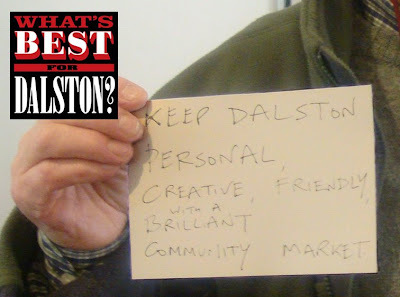 Highlighting the buildings and streets of Dalston and the experiences of the people who live and work here, this exhibition will grow and evolve over two weeks, as people join in and add their own stories, photographs, comments and suggestions. The first of a series of walking tours around the ‘masterplan area’ took place on Sunday and focussed on key buildings and sites that the Masterplan for Dalston has earmarked for development. If you are interested in future walks please email info@opendalston.net or call 07531 467276 and we will keep you informed of additional dates and times. So if you are not sure what ‘The Eastern Curve’ is or how proposals will affect the look of Dalston Lane, these walks will help make it clear. Photographs and observations gathered on the walks will be added to the exhibition. The demolished shops on Kingsland High Street, part of the "Western Curve". If you would like to volunteer to help with the programme of events, please email info@opendalston.net - research, photography and filming are particularly needed to make it all happen. The consultation documents for the draft Masterplan are available on the Council's website at: www.hackney.gov.uk/planning-consultation.htm Printed documents are available for reference at all of Hackney's libraries and at the Planning Reception at 263 Mare Street, E8 3HT. You can also email strategic.delivery@hackney.gov.uk or call 0208 356 7740 for more details. You can make your own comments on the Masterplan proposals until Friday 15 May. Part of the Eastern Curve.